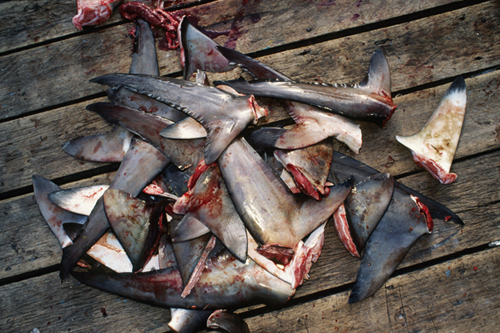 Animal Justice Canada is working to educate legislators and the general public on the cruelty and waste inherent in shark finning. Fueled by the demand for shark fin soup–considered a delicacy in some cultures–shark finning is a widespread practice that occurs when a shark is captured, its fins are sliced off, and the shark is discarded back into the ocean. Shark finning causes immense pain and suffering, as the sharks are almost always still alive when their fins are removed. After being tossed back into the ocean without their fins, the live sharks usually suffocate to death. Sharks breathe by having water flow through their gills while swimming, but without fins, they are unable to swim and cannot absorb adequate oxygen. The result is a slow, painful death. To date, more than 90 countries worldwide have put restrictions on the practice of shark finning in their territorial waters. In June 1994, the Canadian Department of Fisheries and Oceans (DFO) implemented restrictions on shark finning in Canadian waters in accordance with the recommendations of the International Commission on the Conservation of Atlantic Tuna (ICCAT). The DFO implemented restrictions on shark finning under the authority of Fisheries Act, Fishery (General) Regulations,Section 22, which gives broad ministerial powers in implementing licensing conditions. The DFO no longer grants licenses to international fishers for the fishing of sharks in Canadian waters and penalties exist for those who violate their licensing conditions or fish without a license. Licensing conditions for each fishery are outlined in that fishery’s respective Integrated Fisheries Management Plan (IFMP). Applicable IFMPs impose restrictions on catching shark and shark finning and these restrictions are then included on licenses issued to the fishers. 3.1 You are authorised to retain an incidental catch of shark. 3.2 At the time of landing and weighing, all or a portion of the tail fin must be attached to the carcass. Also, the pelvic fins (the paired fins adjacent to the cloaca or “vent”) must be left intact and attached to the carcass. 3.3 Finning (the practice of removing only the fins from the sharks and discarding the remainder of the shark at sea) is strictly prohibited. 3.4 After the weight of the shark has been verified by an observer (dockside observer), fins may be sold, traded or bartered, but only in proper proportion to carcasses sold, traded or bartered with a maximum of 5% fins per dressed carcass weight. These restrictions are often critiqued for not being sufficiently stringent. Furthermore, the restrictions do not ban the imporation of shark fins into Canada caught in international waters or elsewhere. Although shark fin products are still legal in most jurisdictions, several municipalities in Ontario have moved to prohibit shark fin. Brantford, Ontario became the first Canadian city to ban shark fin when its city council voted unanimously to do so in May 2011. Oakville (July 4, 2011) and Missisauga (October 12, 2011) followed suit with similar bans. In June 2011, Toronto city councilors Glenn de Baeremaker, Kristyn Wong-Tam, and John Parker put forward a motion to ban the sale and consumption of shark fin in Toronto. After concerns regarding municipal jurisdiction were expressed, on October 12, 2011, twelve Ontario lawyers released a legal opinion stating that Ontario municipalities–including Toronto–have jurisdiction to ban shark fins. You can read the full opinion HERE and read the web story in the ‘Media Releases’ section of this website. On October 25, 2011, Toronto passed a motion to ban shark fins and requested that the Provincial government do the same. Since then Ontario municipalities London, Newmarket and Pickering have also implemented bans. On July 16, 2012 the City of Calgary also voted in favour of banning shark fin. In British Columbia municipalities Abbotsford, Coquitlam, Nanaimo, Port Moody, North Vancouver and Maple Ridge have implemented bans while on September 18, 2012 Vancouver City Council unanimously passed a motion to instruct its staff to work with the neighbouring municipalities of Richmond and Burnaby on a regional ban on the sale of shark fins. In Toronto a pro-business front group named Fair and Responsible Government Alliance (FARGA) was created to fight shark fin bans. They commenced an Application with the Ontario Superior Court arguing that the Toronto shark fin ban is invalid because it is outside of municipal jurisdiction. Animal Justice applied for intervenor status in the case but was rejected on October 25, 2012. The matter was heard by the Court on November 5, 2012 and on November 30, 2012 Justice Spence ruled that the bylaw is ultra vires. The full decision can be found HERE. Read the media release HERE. A copy of the Application Record is available HERE. A copy of the Factum of the moving party is available HERE. A copy of the City’s Factum is available HERE. On February 21, 2012, by a majority vote of 39 to 3, Toronto City Council carried a Motion not to appeal Eng v City of Toronto, a decision of the Superior Court of Justice striking down the Toronto Shark Fin By-law. The carried Motion also requested that the City Manager, in consultation with the Medical Officer of Health, reconsider the issue and report such findings at the June 27, 2013 meeting of the Licensing and Standards Committee. Read the media release on the vote HERE. On March 27, 2013 it was reported that the City of Mississauga will be reviewing its shark fin ban in light of the Toronto Court ruling. See an article on the issue HERE. Also on March 27, 2013 Federal NDP MP Fin Donnelly’s private member’s bill to ban the import of shark fin separated from the shark was voted down 143 to 138 at second reading due to opposition from the Conservative Party of Canada. Read an article on the issue HERE. On May 1, 2013 Mississauga voted to repeal the city’s shark fin ban. An article on the the vote can be read HERE.